One morning an incredibly nice Carole Allen of New Jersey googled “Let Women Alone,” because a friend of her mother’s, an antiques dealer, had the poster in her garage–and she came upon my blog talking about this “lost” 1920s film, part of which was shot at Princeton-by-the-Sea–an email to me, a friendly back-and-forth exchange, AND two days later, here’s the marvelous poster. 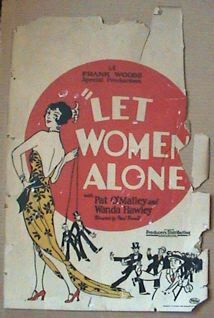 I do admit, however, that I didn’t anticipate a poster promoting “Let Women Alone” photographed on what was a very rural Coastside, to have such a sophisticated flavor. There’s no fishing boats, farmers, or artichoke fields depicted. Carole Allen: I was doing a quick search for any info about this movie and was surprised to see that you had been attempting to hunt it down. While I’ve never seen it and don’t know anything about it, a friend of my mother has an original movie poster for this film in her garage (at least she did last year). If you’d like a picture of it for your archives, next time I’m out that way, I can take one for you. Tell me, is it for sale? Isn’t it neat? I love that she’s dangling the two men and looking at the viewer. I’m sure the poster is for sale – my mom dropped it off this morning as she went to visit her sister. I’ll call her friend and ask how much – I doubt that it’s much as it is not in the best of condition and should be restored. (Photo: Peninsula Studios, San Mateo County History Museum). But it was rough going for the indie Peninsula Studios. The comically talented Wallace Beery co-started along with such unknowns as Wanda Hawley and Ethel Wales. Frank Woods, a former New York drama critic, produced; Paul Powell directed. In the silent version, the wild tug boat chase was filmed on location at Princeton. 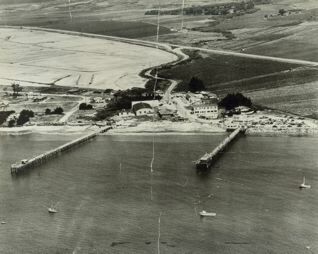 In the 1920s, Princeton, with its colorful roadhouses, buzzed with feverish activity as wary rumrunners unloaded illegal whiskey at one of three wooden piers. 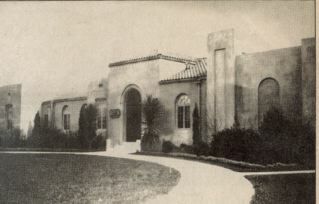 Peninsula Studios built a “cinema city” in San Mateo in the early 1920s (see “The Golden Gate and the Silver Screen” by Geoffrey Bell). Two “mammoth” stages featured the most high tech lighting equipment. Individual buildings housed editing rooms, a lab for developing film, and, when needed, there was plenty of open land for the construction of exterior sets. The stars weren’t forgotten as their private dressing rooms included luxurious bathrooms. The maverick motion picture company was taking a big financial risk–in the 1920s the well-financed film industry was headquartered in New York and Hollywood–NOT the Bay Area. Thwarting conventional thinking, Peninsula Studios moved ahead intending to produce successful theatrical films.